The biggest threat occurs when the measurements are made on a live ≤1kV installations and with the lack of basic protection, as well as with limited anti-shock safeguards. In such a case, a threat of direct contact occurs, although maintaining a minimum isolation distance not resulting in a contact is acceptable. Control and measurement works, e.g. during an installation commissioning, usually mean working on a live installation (≤1kV in active parts of the installation and on electrical loads). Therefore, in accordance with the regulation from the Journal of Laws of 2013, item 492, they are treated as maintenance works and should be governed by OHS standards for electric devices. If control and measurement works are conducted near live components, then according to the regulation, an external work zone should be 300mm. With voltages over 1kV, all measurements should be conducted with necessary isolation distances, and external zones should be larger - their size should depend on the actual voltage value. electrocution current value (current resulting in permanent consequences of electrocution). It is assumed that the acceptable value of a current running through a human body should not exceed 25mA in case of alternating current (AC) and 60mA in case of direct current (DC). The values are connected with the estimated resistance of a human body, which is defined as 1000Ω. Due to that, safe voltages are 25VAC and 60VDC, and in particular environmental conditions they may be half of those (12VAC, 30VDC). (after Centralny Ośrodek Szkoleń i Wydawnictw SEP — the National Centre for Trainings and Publications). 10-15 Strong cramps. Hands can barely let go of the cable. Severe pain in the fingers, arms and the back. 15-25 Very strong cramps. Hands cannot let go of the cable on one’s own. Severe pain. Problems with breathing. above 30 Extremely strong cramps. Fainting. Cardiac fibrillation. 5-8 One begins to feel the current running through the body. The feeling of warmth. 20-25 Muscle cramps. Noticeable feeling of warmth. 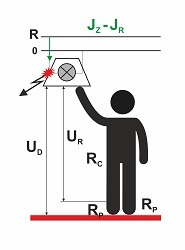 Apart from safety precautions connected with the risk of electrocution, there are also legal requirements for control and measurement works. They were defined in the Energy Law Act (Journal of Laws 06.89.625) and the regulation from the Journal of Laws from 2003 no 89, item 828. In accordance with the existing normative acts, persons responsible for operating electrical grids, devices or installations, should be appropriately qualified. Commissioning and operating measurements are included in these works. Therefore, those responsible for the supervision and measurement should own appropriate qualification certificates. rules of conduct before and during measurements. General technical requirements on the measurement apparatus are defined by the PN-EN 61010:2011 standard (Safety requirements on electrical measurement devices, automation, and laboratory equipment). The requirements for installation measurement devices were further developed in the PN-EN 61557:2007 standard (Electrical Safety in Low Voltage Electrical Grids with Alternating Current of up to 1kV and Direct Current of up to 1.5 kV. 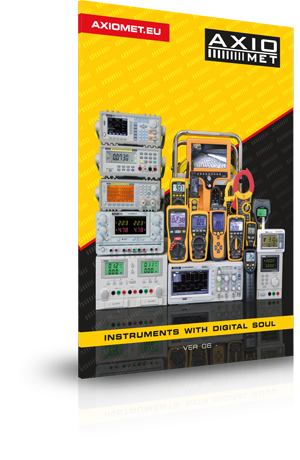 Devices for checking, measuring, and monitoring safety controls). Apart from technical requirements resulting from the aforementioned standards, each measurement device has to be CE certified, which proves them fully compliant with EU Directives on safety (the Low Voltage Directive LVD 2006/95/EC applies). Observing safety procedures during electrical measurements is extremely important because of the risk of electrocution. One should always remember about all the laws and regulations that define requirements regarding necessary qualifications, conducting measurements, as well as appropriate measurement apparatus.